Fabulouso mosso! Mr. Bouriakov is the miracle flutist! Khachaturian: Violin Concerto in D minor. you keep us in the loop for the best inspiration on youtube! first the masterclass, now this! thank you! He is awesome! And so is the pianist, by the way. It's interesting that he went through years of music school, probably the same time I did during Soviet Union and his embouchure never got 'corrected'. Or, I wonder if he got his music education somewhere in Asia since the only times I have seen him play he was accompanied by Asian musicians. He doesn't move too much when he plays which could again be consistent with being trained in Asia, people there don't really show their emotions. Very interesting! I'm hoping we'll learn more about Denis now that he's in New York, playing in the Metropolitan Opera orchestra, I think. There are US flute magazines that would love to interview him. 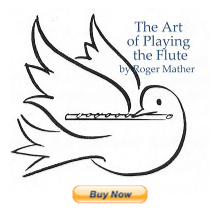 Fascinating to find out more about his approach to the flute! According to Altus.com's artist bio, Bouriakov was educated in Russia and then the Royal Academy of Music in London. He was a student of William Bennett. I heard him play at this year's Seattle Flute Festival, and have also heard him on Met broadcasts. He's really excellent and very gracious. Very big solo tone, very centered. At the Flute Festival, he did a workshop on tuning harmonics for a centered, non-breathy, on-pitch tone. It's amazing that he has become the Met's principal at only 27 or 28. Olya - There is a pretty complete artist's biography at altus.com. It says he was born in Crimea and attended Moscow Central Special Music School, studying with Professor Y.N. Dolzhikov. You might find the bio interesting. We still have relatives in Crimea! I used to spend a month there every year. It's not very far from where I lived, takes overnight to get there by train. How awesome! Moana, thanks for letting me know, I can't wait to read it!